Flowers, Fruit and Seeds: Blooms mid-spring, fruit (samaras) hang on late into fall, wings nearly parallel. Culture: Sun to part shade, very adaptable, very hardy (popular in east and midwest), performs best in well-drained soil. Relatively free of disease and pest problems. Flowers, Fruit and Seeds: Fruit (samara) 1.3-2 cm long, much incurved, ripen in early fall. 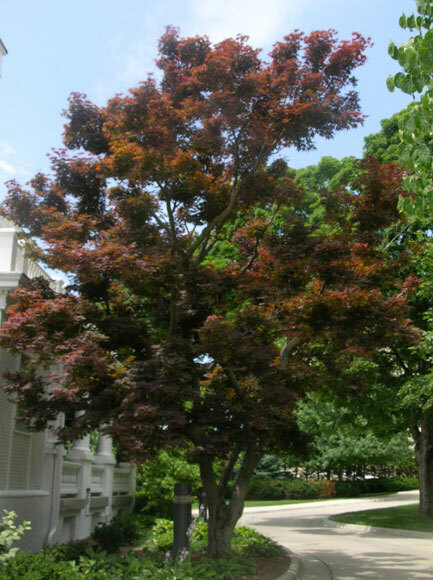 Foliage and Bark: Leaves opposite, simple, 4-9 cm long and wide, rounded or wedge-shaped at base, very lustrous dark green above; fall color yellow, orange and red. Flowers, Fruit and Seeds: Small greenish yellow flowers are hardly noticeable. Fruit (samara) about 2 cm long wings, parallel. Culture: Sun. Well-drained acid soil. Drought resistant.